This is a pretty exciting time in the storage arena with the release of the M.2 form factor and much faster NVMe-based drives. Not only are the physical size of drives going down, but pricing as well, while capacity and performance is going up. Even more good news, the M.2 socket using PCIe 3.0 4x slots, the bandwidth limit of SATA3 has been eclipsed, and by quite a lot, from 6Gbps to 32Gbps allowing for those performance increases. These NVMe-based drives are able to reach some impressive speeds and impressive IOPS levels. 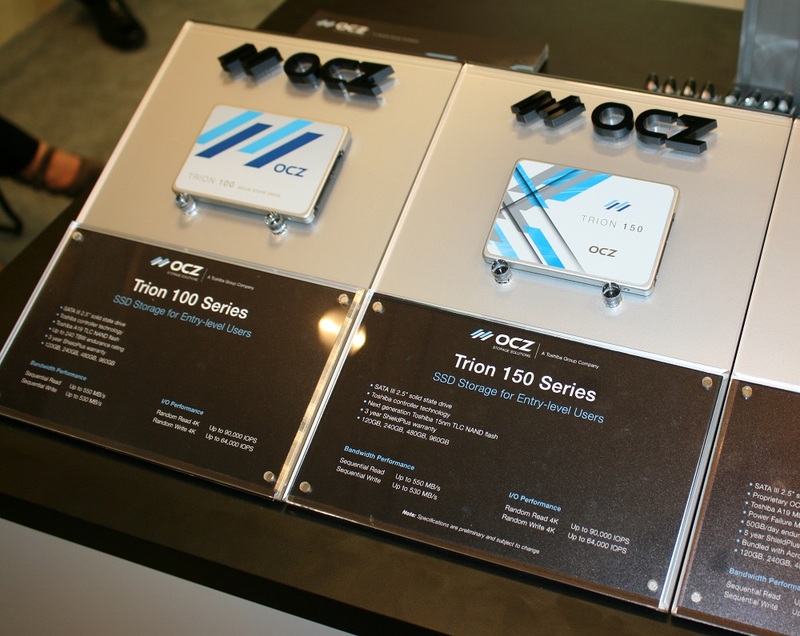 To that end, our CES coverage continues with a visit to our friends at OCZ. I was excited to see them with dreams of looking at their latest NVMe-based offerings, and I was not disappointed. Before we get to M.2 drive, I had a chance to see the new SATA-based Trion 150 they will be releasing, hopefully mid-Q1 (soon!). If you remember our review on the Trion 100, it was a solid price-to-performance SSD that was primarily focused on read performance versus writes, like a lot of faster drives are, particularly in the 4K random realm (not that it was a slouch there either). It was more focused on being a storage drive or one that wasn’t written to a lot and certainly showed it did a good job at it. The Trion 150 will come with slightly better performance around 550MB/s sequential reads and 530MB/s sequential writes. IOPS are 90K for reads and 64K for writes. Seeing the specifications, it is clear the focus is the same as the previous iteration, high performance in reads. It will be using Toshiba’s next generation 15nm TLC NAND flash and come in capacities ranging from 120GB to 960GB. We should see these on the market mid-Q1. 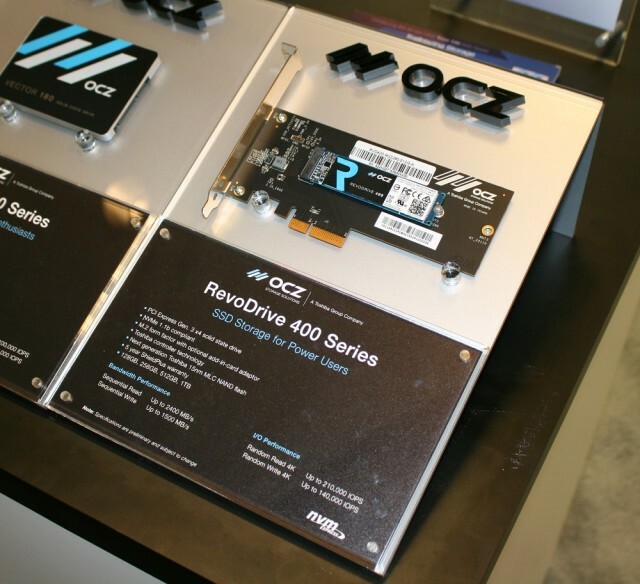 Next is the OCZ Revodrive. We all remember these speedy drives in all their PCIe glory from years past; the flaghsip performer of their consumer line. Also coming out mid-Q1 is the latest Revodrive 400 series. As you can see from the picture below, it comes in the recognizable PCIe form factor and also M.2. The drive is NVMe 1.1b compliant, uses the in-house Toshiba controller, and will range in sizes from 128GB all the up to 1TB. Like the Trion 150, it will also use the latest 15nm MLC NAND flash. You can expect read speeds of 2400 MB/s sequential reads, and 1500 MB/s writes with IOPS of 210K and 140K respectively…a burner indeed. Exact pricing wasn’t available but OCZ expects it to be similar to the Samsung 950 M.2 drive. That should make it incredibly competitive against the Samsung 950 and the Intel 730. Keep an eye out on the front page for some reviews in a few weeks and stay tuned for more CES coverage!